Commemoration Day at Glenalmond College always gives me that ‘end of term’ feeling. It’s really Speech Day – with Mark Beaumont as the Guest of Honour. And it’s Leavers’s Day. I once described it as Hogwarts meets Glyndbourne – Range Rovers and picnics in wicker baskets. I come and we have a Service which has bits of the Funeral Service from the Book of Common Prayer. Strange really – but that’s the tradition. Glenalmond is an Episcopalian foundation so it’s important for us and I am fairly deeply involved – not just in the ceremonial but also in the management. I guess that Gladstone, whose statue stands in the Quadrangle, would have covered his ears as the Red Arrows flew over at 1653 precisely – making a slight shimmy to the right on their way from Edinburgh to Armed Forces Day in Stirling. 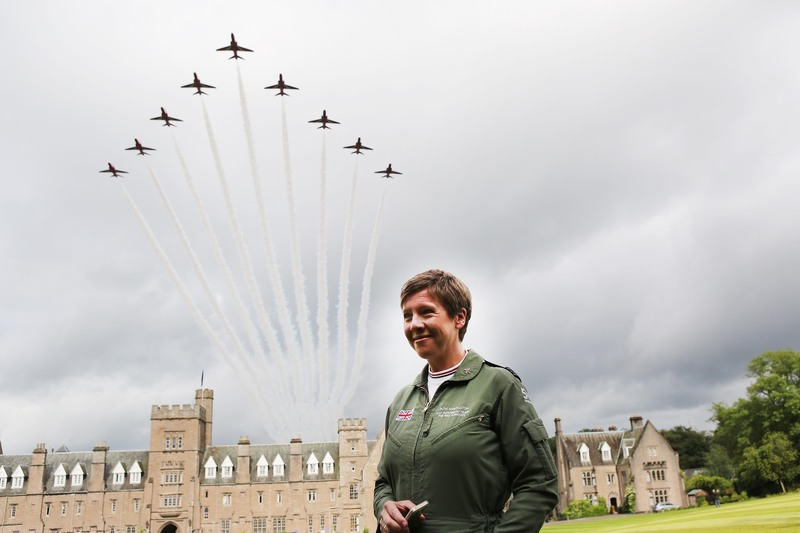 The flypast was arranged by their Manager, Squadron Leader Ruth Shackleton, as a mark of her own time at Glenalmond.